It is never easy to pass judgment on old institutions whose roots go back to 1438 supplying its products to glorious owners such as Mohammed the Second, the Venetian Republic, Napoleon, the Asburg Imperial and the Royal Italian navies and practically the entire yachting world within this century. Very few can display such clients portfolio. Throughout the time Camuffo's yachts have been gradually adapted to the changing tastes, always offering unique performance and shapes. The M/Y C45 FB is no exception to the uninterrupted production spanning from 1438 to 1997 and can revive the past craftsmanship. It is a boat extremely well balanced based on a unique hull, purposely designed by Marco Camuffo to offer superior performance. The project result is clear proof of the value of instinct and experience capabilities versus today's computer aided design work. 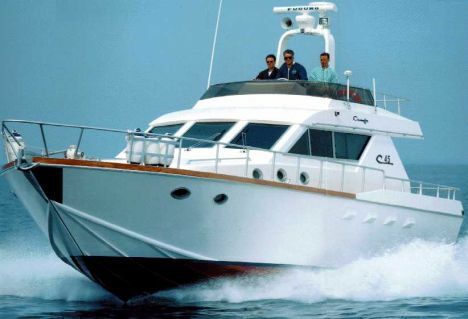 This is evident not only on the product quality and the relevant building efficiency (much has been said on the Camuffo's signature, its elegance, comfort, the noise insulation of these yachts, very often branded as the "sea Stradivarius") but and foremost on the performances, the seakeeping capabilities and of the outstanding speed achieved with relatively small propulsion plants adopted with consequent reduced fuel consumption. The most immediate conclusion when inspecting the C45 FB are the equilibrium between the traditional and very accurate wooden construction which is extremely simple and reliable (so that the entire boat and fittings can be virtually disassembled with a screwdriver) and the outstanding futuristic performances. Want a proof? I boarded the boat in a hot and dump morning tired and sweating and after a few minutes asked to switch off the air conditioning only to be told the boat is not fitted with one! 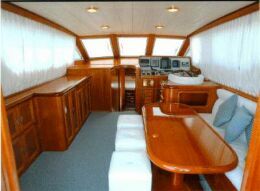 The perfect insulation is the result of reinforced marine plywood, teak wood and the best available wooden essences extensively used throughout the boat. After casting off and on handling slowly the throttles one can clearly feel the boat lifting lightly moving through the water. In open waters the M/Y C45 FB takes an easy and steady planning ride achieving the cruising speed of 30 knots at 2200 rpm and a consumption of 80 liters/hour about. At 2800 rpm a 40 knots top speed is easily achieved. Concluding the yard's traditional philosophy capable of producing unique and outstanding boats is again demonstrated on this C45 FB which features are deservedly highly placed in the yachting world. Note: Average miles range, at a given rpm, is obtained dividing the total fuel capacity (1600 liters) for the "liters/mile" corresponding to the entered rpm. Plotted fuel consumption is declared by the engines' manufacturer: tuning of the engines, weight of persons, stores, etc... on board, hull conditions and propeller type can effect the real fuel consumption. 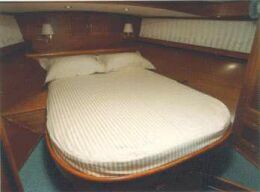 Lay-out and main features: one double bed cabin and two single bed guest cabins, lockers, two complete toilets, main saloon with steering station, dinette with table, wet-bar area, fully hidden galley, "khaya ivorenis" and exotic wood essences furniture, wide range choice upholstery. 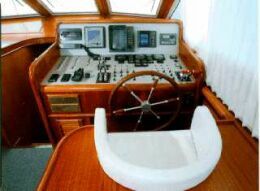 Steering station: helm, magnetic compass, complete engine gauge, indicators, VHF (double station), autopilot with repeater on flying-bridge, 48 miles range Furuno radar, depth sounder, Navionics Micronav plus GPS/pan navigator, 220/24 v inverter, internal / external intercom, chart table to the dashboard's port side. Galley: fully hidden, two stainless steel sinks, working top, cooking stove with two gas and one electrical ranges (oven and dishwasher are optional), 120 liters refrigerators. Seakeeping: testing Camuffo boats is always challenging because of its well known excellence in performances, seakeeping and noise insulation. The yard's tradition and experience renowned throughout the centuries are once again confirmed by the outstanding observed performances. remarks on Camuffo boats are uncommon. The long yard tradition ensures a very well balanced product but, just in case, a more equipped flying-bridge could be the final touch.